Table exhibited: World Wide Chocolate Heart Part 1 Helsinki-Brussels 2000 (Lasipalatsi). Part 2 / Helsinki-Malmö 2002 (TAIK gallery). Part 3 Helsinki-Bayamón, Puerto Rico (Kiasma). Paradise exhibition, Sculptor Gallery, Helsinki 2002. 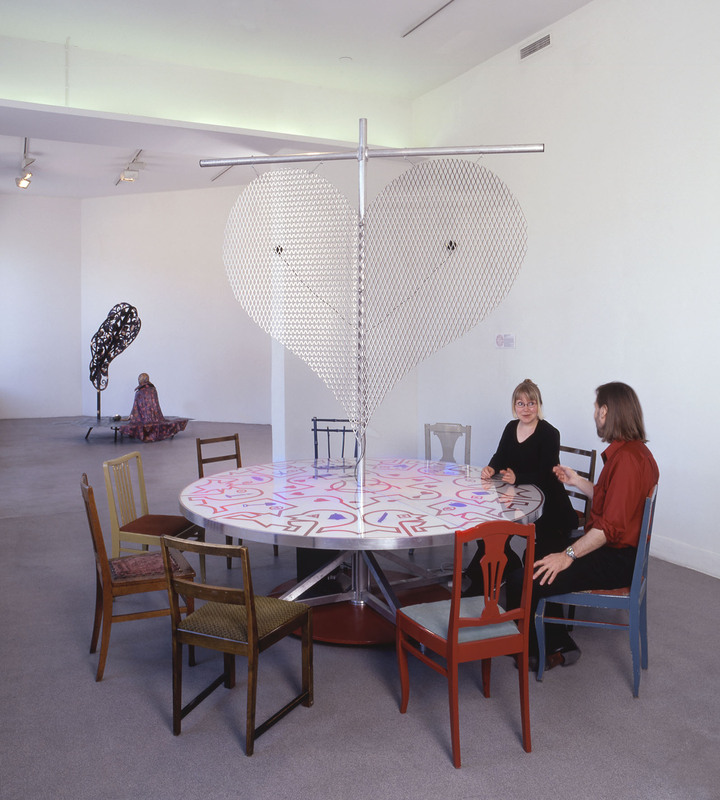 Andersson’s intention was to make a table, where people feel free to communicate on equal basis with other people. ”I have noticed that the environment affects how freely people express themselves” says Andersson. The Ceremony Table is one in a series of tables made to function in the borderline between a sculpture and a functional object. Many times communication occurs on unconscious levels. The transportable Ceremony Table, made of aluminium, honours these levels by making it possible for people around the table to communicate also with their feet! 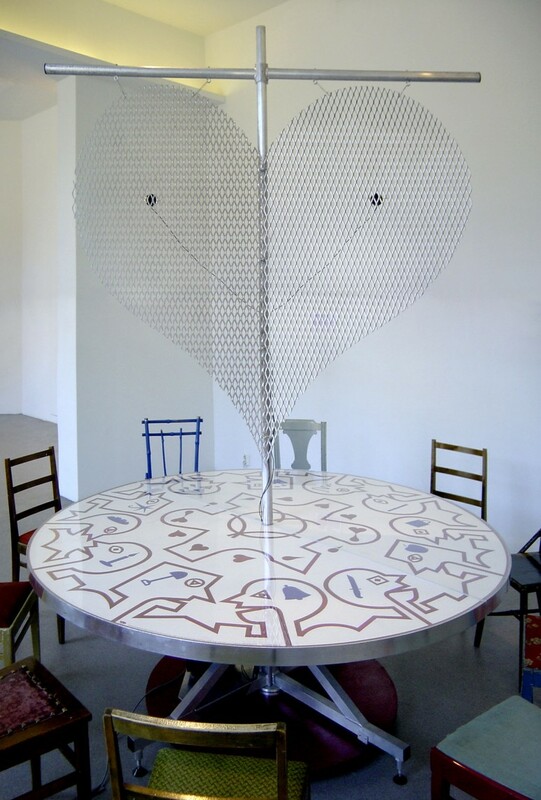 We can, with our feet, turn the red round desk below the table, which also turns the mast with the heart shaped sail. Another person can interact by stopping the turning and try to make it turn in the other direction. The print, seen through the transparent acrylate sheets, is designed by Andersson. Sound artist Shawn Decker, professor at the Chicago Art Institute, has made a built in sound for the table, which mixes chocolate licking sounds with sounds from the sea. Under the table is a subwoofer which is connected to a pair of small speakers fastened on the sail, made of aluminium.